Set Your Data Types in Power Query! Heed the following advice now, or suffer the wrath of a painful bug later. The bug is the result of, ahem, a Power Struggle between the Power Tools (Power Query and Power Pivot), where each wants to be “in charge” of things like table name, column names, and data types. Table Name – change this in PQ’s Query Settings, as pictured above. (Don’t right click and rename the resulting sheet tab/table in Power Pivot). Column names – right click and rename them in Power Query (don’t right click and rename in Power Pivot). 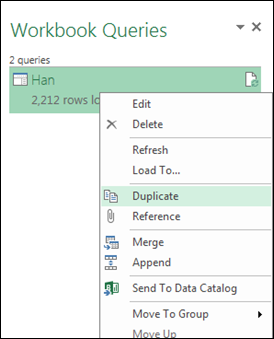 Deleting Columns – again, delete them from the Power Query side, using the Delete key or the Remove Columns button on the ribbon. Don’t delete on the PP side. Data types – use the Data Type dropdown on PQ’s Query Editor ribbon (pictured below). (Don’t use the similar dropdown’s on Power Pivot’s ribbon). If you use Power Pivot to change any of those, even once, chances are good that PP will now think it’s “in charge” of ALL changes to that table from that point forward, and then if you EVER change ANYTHING in Power Query (even things OTHER than table/column names or data types, like filtering out bad rows), you are suddenly confronted with this problem, for which in Excel 2013 the only simple “fix” is to delete your entire table from Power Pivot and start over again. Blech. So let’s set those data types now, just to be safe in case we need them properly set later, OK? Of course, we could obviously now do the reverse steps for Leia – add the LOOKUPVALUE column, the measure, etc., but we won’t show that here. Let’s say we don’t want to take the easy way out. We want to be hard on ourselves, for reasons that may become clear later. So, How Do We Create the MergedFollowers table? Power Query of course! It is VERY important that the relationships point in the right direction. Han and Leia should be your Lookup tables. Don’t get that backwards or nothing subsequent will work. Note that we ALSO should have removed the [Follow Date] column from the MergedFollowers table – we don’t need it, and it’s misleading: for the duplicates, we’ve arbitrarily been “left” with the Han or the Leia follow date, not some sort of merge or average or whatever. (Yes, I noticed this right before posting, that I’d left the column in by accident). No Calculated Columns in the Hard Way! Rather than adding calc columns and then summing them up, in this approach our measures can follow the Many to Many pattern, or at least a close cousin thereof. WooHoo! The Same Answer We Had From the Easy Way! Advantages of the Hard Way? Simply put, the hard way is more Dynamic. First off, as we add more tables, like the Luke table, we don’t want to have to add pair-wise calc columns for Luke-Han overlap and Luke-Leia overlap, and then later Lando-Han, Lando-Leia, and Lando-Luke (when we add the charismatic Lando and his millions of followers to the mix). Of course, even in the Hard way, we DO still have to add pair-wise measures, so, um… yeah. That’s not a tremendous savings. If we have properties of followers, and those properties can be DIFFERENT, for a single follower, depending on their relationship with Han or Leia, the Hard way takes care of us. The formulas for those columns are not important – they are just randomly-generated. The important thing is that a SINGLE USER can be a Lurker for Han but be Active for Leia, or vice versa, etc. And our Hard Way measure lets us build a pivot like the one above, where a simple LOOKUPVALUE, being statically determined by “is this user in both lists”, will not help us. There are a MILLION things we could continue on and explore at this point, like percentage overlap (which is just a simple DIVIDE measure), displaying the lists of users (also pretty simple), but wow, this is one LONG post already. So let’s call it quits for now. I would suggest you could also get around the need for measure pairs by holding two complete fact tables (substitute Han for Fact1 and Leia for Fact2) with all followers and the associated name (Han, Leia etc) in the table as a new field ie union them together. Naturally you would need to filter out where the names are equal in both tables at run time as comparing Han to Han would deliver obvious results. This approach is also VERY quick and removes the need for M2M relationships. If you also have a bridge table of all follower IDs (distinct list) and join to the fact tables Fact1 and Fact2 to Bridge (opposite way to your example), you can plot these measures on a pivot with follower on row and easily see where those followers drop into these measures. Fact1[Name] and Fact2[Name] as slicers and the measures will compare which ever name pair you select. Hope this helps give even more fun to this subject! Perf-wise, my gut instinct was that the M2M approach was going to be faster than iterating with FILTER or SUMX (and text-parsing at each step), so I didn’t go down that road. The single fact table idea is compelling. Seems like I would still need some sort of disconnected slicer tables to properly leverage it, agreed? (Again, just speaking from instinct, not actual thinking). The real “bummer” about this problem-space is that we end up with Lookup/Dimension tables that are Data/Fact table-sized. The work I’m doing with our client involves 100k+ followers for each account for instance, and I expect performance to start degrading once we start getting into more interesting corners of the analysis. I was halfway expecting you to break out some sort of fancy SUMMARIZE or similar and tell me that’s 10,000 times faster, perf-wise. Ha! Well, 100k+ lookup, summarize, contains, crossjoiny thing. Sounds like a fun challenge! 100k unique values (well, actually more than that considering that it might be 100k+ for each) are going to provide a headwind to all of these approaches, I think. But, they’re the sort of stats we all like playing with to see which approach really shows some muscle. Of course, we should possibly dabble with 2016’s natural joins……err, should we…!!? Can you smash up a sizeable desensitised workbook for us to hack around with? 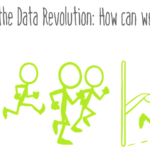 Great examples of the impact data modelling has, really enjoyed it. Example data is set to 10k for file size, but just check it out with 100k rows: In sheet “Parameter” cell B2 type in the number of the desired rows of the input data (will be generated automatically). Yeah, disconnected tables would almost certainly be required to drive the selections of the 2 (or more) names to be compared. The idea here is to inject a little fun into the process, for everyone – readers yes, and also me. It took about 6 hours total to write that post and it’s good to have it feel less like work and more like fun. I do sincerely appreciate the feedback. I’m just explaining why this one particular point is one I disagree with. Appreciated the deep dive into a Power Query solution; the timing was perfect for my needs. previous post: RANKX-apalooza: Within and Across Groups, With Filters, Etc.